by Betsy: Hey, it's a Lauraknot! In honor of I Am The Diva's 5th birthday and challenge #249, I created an Auraknot Divadance duotangle and added a little rounding. But, I like to call it, a Lauraknot! 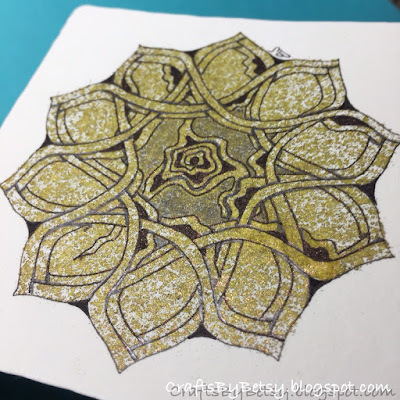 I used the negative from a die cut (Spellbinders Nestabilities series) using it as a stencil then spritzing it with LuminArte shimmering mist in golden bamboo before tangling. Perhaps you get a slight glimpse of the shimmery color. Using the die cut negative was inspired and the misted colour as a background looks great. 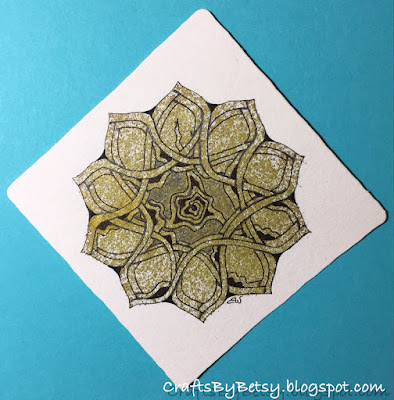 The finished tile has a rose window sort of look to it. Very nice indeed. "Lauraknot" ... yes, indeed! Wonderful! We have chosen a very similar shape for the Lauraknot and yet we have a very different result. Amazing, Zentangle is like that isn't it. I love the colour you have added to yours, very artistic. I'm really loving your twist to Auraknot! Lovely expression of this challenge! Wow, I love this tile.